Aaron Sorkin is one of the most acclaimed, beloved, hated and, if nothing else, identifiable screenwriters of modern times. Probably best known for his primetime drama The West Wing, the sound of a Sorkin screenplay is unmistakable—witty, fast-talking dialogue or monologue, intelligent-but-acerbic male protagonists, and morality tales with politically liberal messages. While known for his smart stories of government and politics, he’s also written quite a bit about the media industry and television in particular. While his style can be polarizing, Sorkin is an undeniably brilliant writer, responsible for modern classics such as A Few Good Men, and recent hits like The Social Network. He’s won an Academy Award, a Golden Globe and several Emmys, and continues to be a powerhouse in both Hollywood and television. 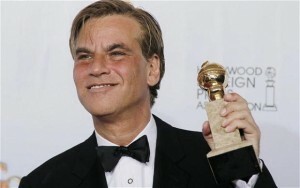 Sorkin was born in 1961 in Scarsdale, a suburb of New York City, and while growing up was very active in theater. He actually wanted to be an actor during college, when he earned a Bachelor of Fine Arts degree at Syracuse University in theatre. Sorkin worked as a limo driver and a singing telegram performer while struggling as an actor in New York while in school. But he soon realized that his greater talent was in penning characters rather than playing them. Soon after graduating, he began writing off Broadway plays, including his first script Removing all Doubt, and then Hidden in This Picture in 1988. It was while talking to his older sister Deborah, a Navy Judge Advocate General, about a case she was working that he came up with the idea that broke his career. Based on the case, he wrote a stage version of A Few Good Men, a military courtroom drama about Marines who killed their fellow soldier. Before the play ran, Sorkin sold the movie rights that would lead to an Oscar-nominated film starring Demi Moore in the role based on his sister. His next movie was Malice, a so-so crime thriller starring Alec Baldwin and Nicole Kidman. But Sorkin would really find his niche and his style with The American President, a romantic comedy about a widowed president played by Michael Douglas, and his attempt at dating an environmental advocate played by Annette Benning. The film was a huge hit, and earned him a reputation for portraying realistic and relatable characters and situations in American politics. In 1998, Sorkin turned to writing for television with the cult hit Sports Night, about the cast of a fictional sports news show not unlike ESPN’s Sports Center. The show was worshipped by many critics and fans and won multiple awards, but had poor ratings, only staying on the air for two seasons on ABC. Undaunted, his next project would be the most Sorkin-ey, for better or worse, and earn him a name as one of the best American television writers in history. When he originally wrote The American President, the screenplay was a massive, overloaded 385-pages. Sorkin cannibalized some of the content that didn’t make it into the film to create The West Wing, an hour-long primetime drama about the staff of fictional Democratic President Jed Bartlet, expertly played by Martin Sheen. The show ran for seven seasons, but Sorkin and his writing and production partner Thomas Schlamme left as executive producers after the fourth. The West Wing is considered by many to be one of the best television dramas of all time. It featured a dazzling ensemble cast of Bradley Whitford, Allison Janney, Rob Lowe, Stockard Channing, Alan Alda and a number of other rotating names. The show earned Sorkin his reputation for a specific style of writing—fast-paced, witty, sarcastic and at times a bit condescending. Nothing exemplifies this style more than the “walk and talk” in which characters would walk briskly together down hallways, firing razor sharp lines at each other at near-superhuman pace. The show also earned Sorkin a reputation for having a heavy-handed political voice that conservatives loathed and even liberals could find preachy. The Bartlet Administration presented Sorkin’s ideal progressive administration, and characters would frequently deliver lengthy monologues on current events and controversies. But none of this held the show back as it continues to hold an esteemed place in television history. Following The West Wing, Sorkin went on to produce and write Studio 60 on the Sunset Strip, based on a fictional sketch comedy show. There was a great deal of buzz surrounding the show, and critics gave it positive reviews, but it was ultimately canceled after the first season. Many chalked up the failure to unfortunate similarities to 30 Rock, the successful Tina Fey comedy that launched at the same time. After the disappointment of Studio 60, Sorkin took a hiatus from television and film for a few years, but he very quickly bounced back with two huge screenplays. He wrote the Facebook CEO-skewering film The Social Network, which earned eight Oscar nominations and a best screenplay award for Sorkin. The very next year, Moneyball, adapted from the popular book of the same name, would nab Sorkin yet another Oscar nomination. And in 2012 he made a big return to television with the HBO series The Newsroom, this time taking on the media and TV news programs. The high profile show features Jeff Daniels as heroic, truth-spewing nightly news anchor Will McAvoy. He and his staff at a fictional network relive actual, recent news events but through Sorkin’s lens of what an idealized, romanticized news outlet would have done. The show has earned mixed reviews, with some loving it, and others finding it smug or like a series of self-serving lectures from Sorkin. Love him or hate him, Aaron Sorkin has earned his spot on the Mount Rushmore of American screenwriters, and established his own genre of sorts. And while he’s faced his share of stumbles and criticism, he’s nothing if not resilient, firing off the next Academy Award-winning blockbuster or critically adored TV show before the ink on his last review has dried. Thank you for your work. So inspiring. I love it. I feel inspired to be a better human, to live more with my heart and values. I feel to be me because somewhere in this world I will take my place and find it quicker than trying to live a life of mediocrity and pleasing to everyone. I love that although it is ideal we need standards to work towards and if not morals and values and ideals then what? I feel good about the fact that I am alive and have an opportunity of making this world a better place… Even if it means something small by being curteous to those who serve me as a train conductor or the office cleaner or showing recognition to the beggar even if I don’t have money to offer him but to simply say “I see you”. The show The Newsroom on the office doors and windows have lines that look like a bar code. If they are what does it read? ACN? Should Sorkin have stayed on with the West Wing? Of course! It was his ship to run. No way! Better to jump ship than sink with the wreck.